The artificial intelligence-driven video content company AnyClip is introducing a new solution meant to make it easier for online publishers to offer and monetize video content. The solution, LuminousX, scans the content of articles and pages, then pulls in a handful of related video clips from a content library of more than 3 million clips, AnyClip CEO Gil Becker tells Digital News Daily. It works with embedded video players on publishers websites and incorporates a monetization engine to drive advertising. The company’s software analyzes the content of the page and tags people, products, topics and even sentiments, in an effort to determine the right clips to incorporate, brand safety and suitability, and figure out if a particular advertiser would be a good fit for the video. Becker says that around 10,000 clips are added to the library every day from AnyClip’s content partners, which include WarnerMedia, Fox, and Getty. Becker suggests the solution can give publishers more video options, and keep users engaged for longer, because they already know that the user will be interested in the content of the video. “The users show the intent, we don’t predict what the user wants to see, we know what the user wants to see because they clicked on the page they chose proactively, so we know what it is all about,” he says. He cites an article about LeBron James. 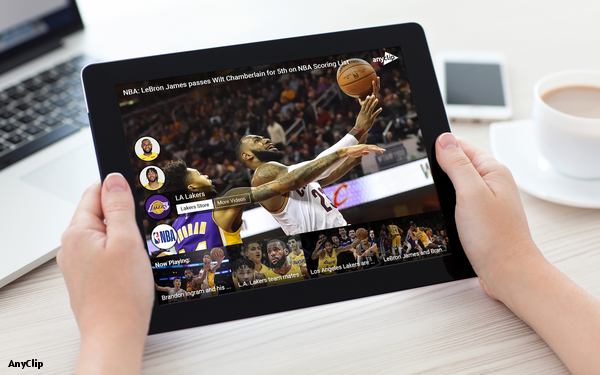 Often, after reading an article, a user that wants to see clips from the previous night’s game would turn to the feeds of YouTube and Facebook. For marketers, the engine also comes with built-in brand safety protections and the ability to target against specific brands or sentiments. For example, a company could request that their ads only appear on pages that are optimistic or happy. Moving forward, AnyClip plans to add commence capabilities to the platform, Becker says, and is interested in using its tech to bring capabilities similar to Amazon X-Ray to over-the-top video platforms.